All that glitters is not gold in "Natural Beauties: Jewelry From Art Nouveau to Now." 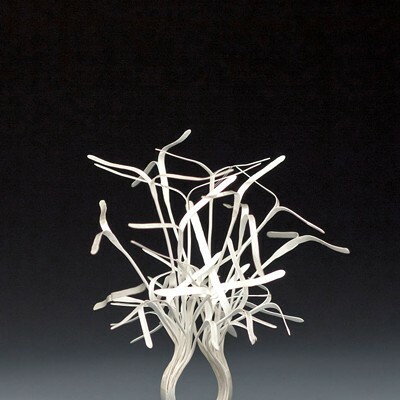 The new exhibit at the Shelburne Museum's Pizzagalli Center for Art and Education also features silver, platinum, brass, titanium and even lead in an array of jewelry that spans more than a century. But never mind metals; the real sparkle comes from a gamut of gems — from white diamonds to black rhodium and everything in between. You expect gorgeousness in a museum-quality jewelry show, and this one delivers with stunning beauty and technical design achievements. What you may not expect — even in an exhibit billed as "inspired by nature" — are the materials that amp up the wow factor: fossilized dinosaur bone, anthracite, corn cobs, wood, leather, crystallized alum, bone, wasp's nest, antler, buffalo horn, abalone, rubber, magnets, taxidermied parakeet, peacock feather, fur and alligator feet. Wait. A dead budgie? Yup. 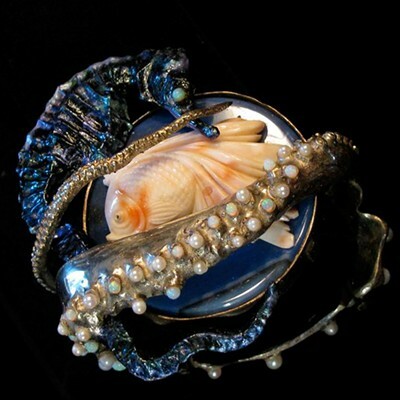 Shelburne Museum curator of design Kory Rogers, senior curator Jean Burks and assistant curator Carolyn Bauer assembled the jewelry for "Natural Beauties," which opened last Saturday and remains on view through March 8. They gathered the 260-odd objects from private collectors, galleries, museums and jewelers themselves. Contemporary Vermont designers Bruce Baker, Mark Prent and Laurie Peters are among them. 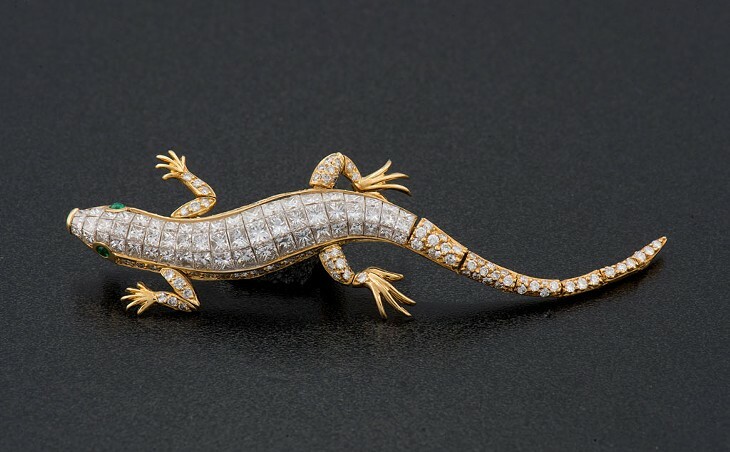 The museum has no jewelry in its own vast collections, but a number of pieces are on loan from descendants of the interrelated Havemeyer, Vanderbilt and Webb families. Electra Havemeyer Webb founded the Shelburne Museum, and the show contains a 1950s swan brooch she received as a gift from her son, James Watson Webb Jr. 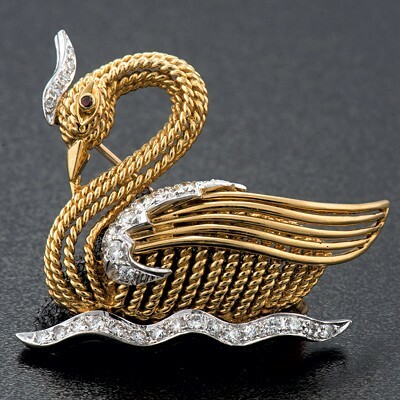 Designed by William Ruser, the graceful little swan is composed of gold, tiny diamonds and other gemstones. Museum staff have given the lower-level gallery in the Pizzagalli Center the quiet elegance of a high-end boutique. The walls are painted a deep plum — a color called Tulsa Twilight, Rogers reveals. Strategic spotlights on the jewelry, most of it encased in vitrines, provide the room's only illumination. That is, not including the blue-green glow of Necklace With Phosphorescence, by designer Kate Rothra Fleming of Charleston, S.C.
From time immemorial, people have found the beauty and variety of Nature fertile sources of inspiration for personal adornment. Whether made from found materials — such as bones, feathers, and stones — or precious metals and gemstones, jewelry has been used to convey social status and express individual style. One theory suggests that human attraction to precious materials and natural motifs is instinctual. This theory, termed biophilia by biologist Edward O. Wilson, postulates "that as humans evolved with the rest of creation, they developed a biologically based attraction for nature and life." 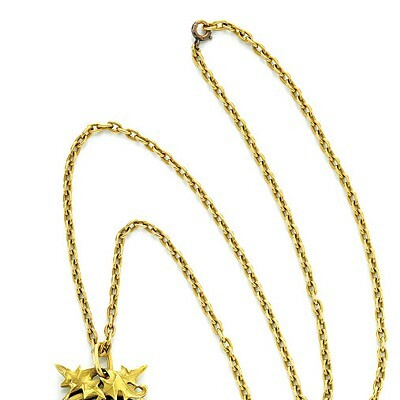 Nature-inspired jewelry is a shining example of our primal desire to connect with the world around us. 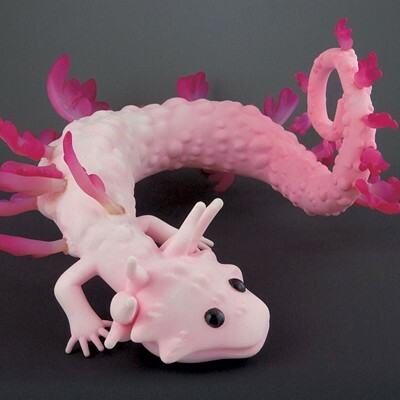 In keeping with that theme, many of the designers included here have re-created critters and, intentionally or not, given them a sort of talismanic power. 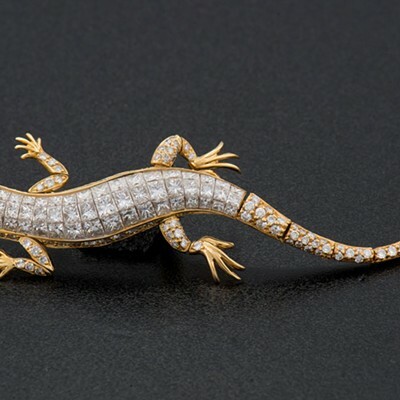 Consider the petite, diamond-encrusted salamander (Jeanne Toussaint for Cartier, 1970) or Prent's remarkable Seahorse and Octopus Bracelet (1995), endowed with opals, pearls, agate and lacquer. The pettable but slightly disturbing Katharine Necklace (2006) was made by German designer Constanze Schreiber from the delicate fur of a fetal lamb. Butterflies flit through "Natural Beauties," rendered in filigree gold, gemstones or colorful enamel. Bugs abound, as well; representatives of the insect world in the collection include ants, a praying mantis, spiders, a "deconstructed" wasp, leafhoppers, beetles and flies. Slime-free slugs and snails appear, along with various sea creatures and reptiles. Some pieces, such as the aforementioned Blue Parakeet — a 2014 neckpiece by Dutch designers Idiots (Afke Golsteijn and Floris Bakker) — are more creepy than cute. 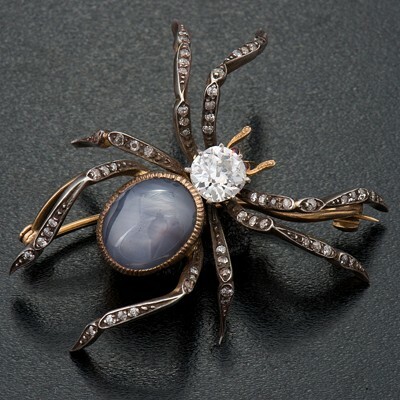 One piece that is rather adorable, the Bee Brooch (maker unknown) in gold and diamonds, has a backstory that illustrates the curators' comment about jewelry's power to convey social status. Electra Havemeyer Webb's mother-in-law, Lila Vanderbilt Webb, wore it — along with a hornet costume — to a fancy dress ball hosted by the Vanderbilts in 1883. Prior to that event, the nouveau-riche family had not been counted among the old-money 400 who "mattered" in New York, per arbiter-of-taste Mrs. Caroline Astor. But the party was reportedly so outrageously ostentatious that it "legitimized the family's place in New York City high society," according to the accompanying wall text. 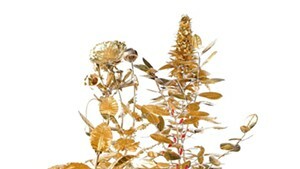 Not to be outdone in "Natural Beauties" are the myriad pieces of jewelry in the "Flora" category. 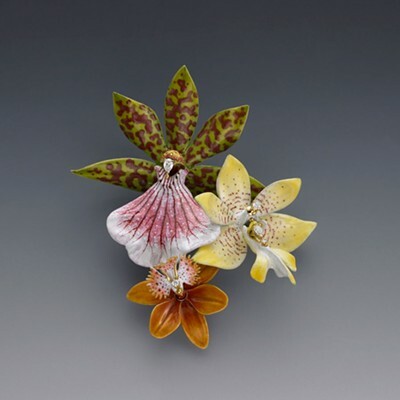 Among the standouts are Bruce Baker's Leaf and Vine Engagement Ring (2014), with its jaw-dropping diamond and curvaceous botanical setting in 14k gold; Californian David C. Freda's enameled and bejeweled orchid brooches (2003-08); Dandelion Puff pieces by McTeigue & McClelland of Massachusetts (2013); and some of the classic, early-20th-century works designed by Louis Comfort Tiffany. But the literally crowning achievement among the botany-inspired creations is a brass replica of cannabis, poppy, coca and tobacco plants. About two feet tall and seriously heavy, the piece is titled "The Crown of Nature's Bounty" and was created this year by Seattle, Wash.-based designer Anthony Sonnenberg. As Rogers writes, "Sonnenberg has meticulously rendered each stem, leaf, bud and flower to emphasize the natural beauty of these notoriously addictive plants from which narcotics are derived." The artist likens his piece to a vanitas still life, intended to remind us of the transience of existence. Sonnenberg sports this piece in a photograph, but, like a few other items in this exhibit, it's more for viewing than wearing. No other jewelry items in "Natural Beauties" carry this weight — actual or metaphorical. Instead, they collectively impress with extraordinary craftsmanship, wit and a near-celebratory demonstration of the timeless, far-ranging desire to adorn ourselves. The original print version of this article was headlined "Jewels and Gems"